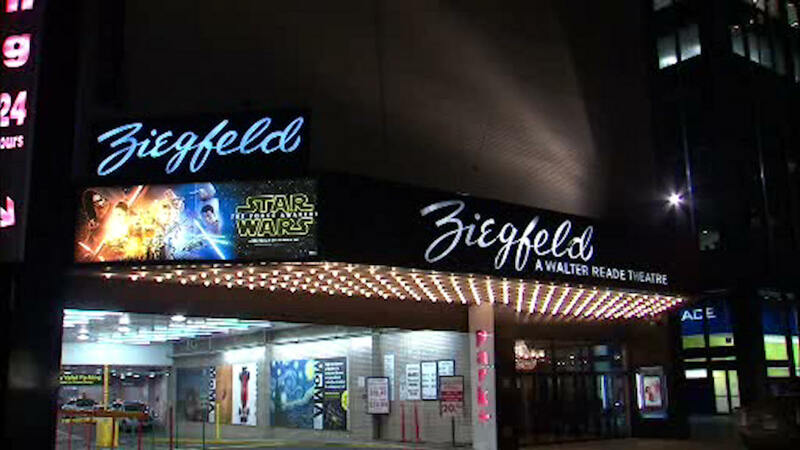 NEW YORK (WABC) -- The iconic Ziegfeld Movie Theatre dropped its red curtain for a final time. Thursday's 10 p.m. showing of "Star Wars: The Force Awakens" was the movie palace's final screening. It was the last chance to see a movie at the largest single-screen theater in New York City, a place that hosted countless star-studded premieres since it opened in 1969. Movie buffs are sad to see it go. The theater's lease wasn't renewed. It had trouble covering its operating expenses. So now, the space will be transformed into a ballroom. The venue, which will undergo a major renovation prior to opening, will be able to accommodate up to 1,200 people for receptions and between 800 and 1,000 for seated events. In homage to Florenz Ziegfeld and his original circa 1927 theater, which was subsequently replaced by the current venue in 1969, the decor will be designed in an art-deco inspired style by the project's architect Richard Bloch.